Take advantage of a unique offering of decorative, stylish, and affordable	carpeting when you visit our flooring store. 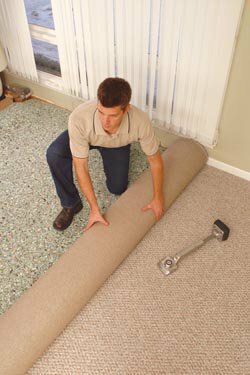 If you are looking to revitalize	your space on a budget, a great way to spruce up the rooms in your home	is with carpet remnants. These are not leftover parts or poorly cut pieces	but instead never-used short rolls of carpet flooring that’s sent	straight to us from the manufacturers. From floor runners to stairway	carpeting, you’ll discover that there are many uses for these high-quality	remnants of carpet in Destin, Fl. Our flooring showroom is packed with name-brand flooring of all types,	including in-stocked carpeting. Due to the established relationships we	have with our manufacturers, we have access to the area’s largest	selection of woven wool and wool blended short rolls. When we cut the remnants off of the roll, this is the perfect opportunity	for you to turn this piece of flooring into a beautiful rug or functional	piece. Speak to our in-house team, who are experienced in binding or serging	the carpet for you. They help give it the appearance of a rug by finishing	the edges in the way you prefer. Our flooring team is happy to show you	the difference between each option. For example, binding is a smaller,	more traditional edge to the rug, while serging draws attention to the	edge and involves a longer stitch. To make your carpet remnants feel like an area rug underfoot, we offer	to pad your new rug with a synthetic padding called “Super Move Not.” This material is slip-resistant, keeps the rug in place, and	eliminates small wrinkles, which could present tripping hazards. The wide range of in-stock carpeting we have available in our showroom	means you will find a pattern to match your design preferences. You’ll	receive assistance from our trained and certified staff to find the perfect	style for your home. Compared to pricing on other flooring, you can enjoy price reductions of	50%-70% off on your new custom-cut carpet. If you are looking for environmentally	friendly fibers like wool, or if you want a traditional trellis pattern,	we have the styles in stock to match your preference. Give your home the	makeover it deserves when you visit our flooring store today.